Dead Space Timson Tools Plasma Cutter Full Size Replica:The iconic Plasma Cutter from the survival horror video game, Dead Space! 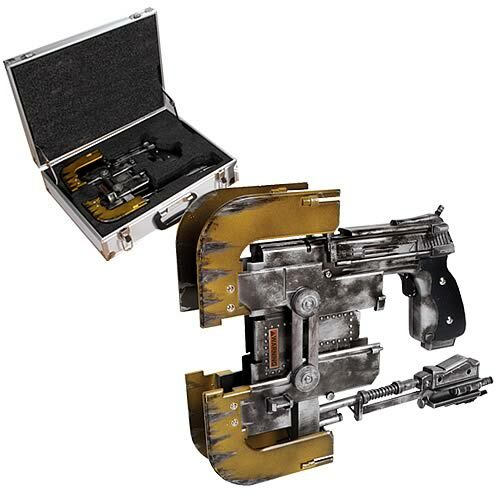 Lights up!Comes in displayable carrying case!Blast away at the Necromorphs!This full size replica Plasma Cutter is approximately 11-inches tall x 3-inches wide x 17-inches long. This Plasma Cutter is the original size of the Plasma Cutter utilized by Isaac Clarke in the first Dead Space video game. Requires 2 AA Batteries. The Plasma Cutter features a built in trigger when activated that reflects the signature 3-blast spot so that the use may line up its target. Laser Dots actually project onto floor, walls, etc.. Ships in a uniquely designed display suitcase. Timson Tool 211-V Plasma Cutter displayed prominently on the outside of the case. The Timson Tools 211-V Plasma Cutter is a mainstay tool for CEC Miners. Using ionized gas and plasma energy from an onboard detachable battery, skilled technicians use it to chip pieces off boulders so they will fit in smelting tubes. For maximum flexibility, this model featuers both horizontal and vertical cutting modes and a quarter meter blade. The 211-V is the first tool that Isaac comes across on the blood=splattered decks of the Ishimura, and becomes his most trusted companion during his harrowing ordeal in Dead Space.